Well I have been waiting for the state fair to post the results before I tooted my horn. But the results are in. My white square yoke won Best of Show in the Smocking division. I also gt a blue ribbon for the pink linen daygown. (It was not entered in the smocking division) That was the project with the most personal investment in it. My silk organza christening gown also won a blue. So that feels good. My doll bishop and Wee Care gown got red, second place ribbons. Nice. Even more exciting is that the category had 34 entries. The goal is to help perpetuate the art of fine needlework. I'll have pictures when we go back to the fair on the 17th. Yeah Martha! Congratulations Girl! So, if I am a "White Glove Lady" at convention, will I get to 'touch' any of these garments? Now to start praying for those grands! Thanks, I keep telling you that you can touch them WITHOT the gloves. :) Yes I should have at least 3 of them. Not sure I will have the christening gown and I won't have the Wee Care gown. They are donated already. 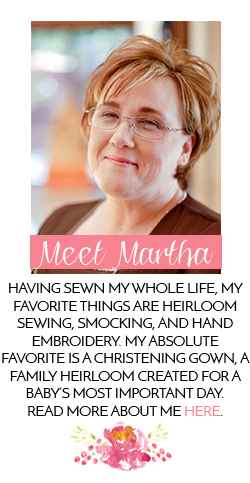 Congratulations, Martha! Your wonderful work deserves all of those ribbons! And talk about bragging rights.....! Thanks Bunny. It is nice to have our hard work recognized.